Apple has officially seeded OS X 10.10 Yosemite Golden Master (GM) Candidate 1.0 (Build: 14A379a), OS X Yosemite 10.10 Public Beta 4 (Build: 14A379b) and Xcode 6.1 Golden Master (GM) (Build: 6A1042b) to Mac OS X developers and non-developers (general public users). Apple has also released new security update patch to fix a security flaw in the bash UNIX shell. The official Direct Download Links of Setup Installer / Delta, Combo Update .DMG Files is available below. The pre-release versions of Mac OS X Yosemite GM Candidate 1.0 (Build: 14A379a) a.k.a Developer Preview 9 and OS X Yosemite Public Beta 4 (Build: 14A379b) official changelog contains; bug fixes, performance and security improvements with new features and functionality. While, Xcode 6.1 GM changelog holds; inclusion of iOS 8.1 beta SDK and Mac OS X 10.10 SDK with swift programming language for OS X Yosemite and OS X Mavericks. 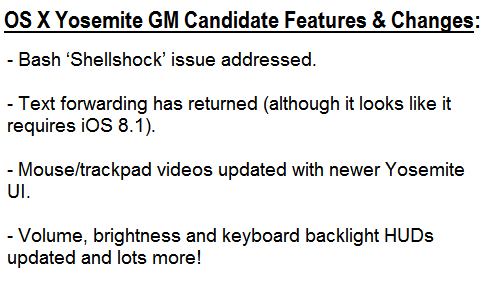 What's New in OS X 10.10 Yosemite GM Candidate Features & Changes? 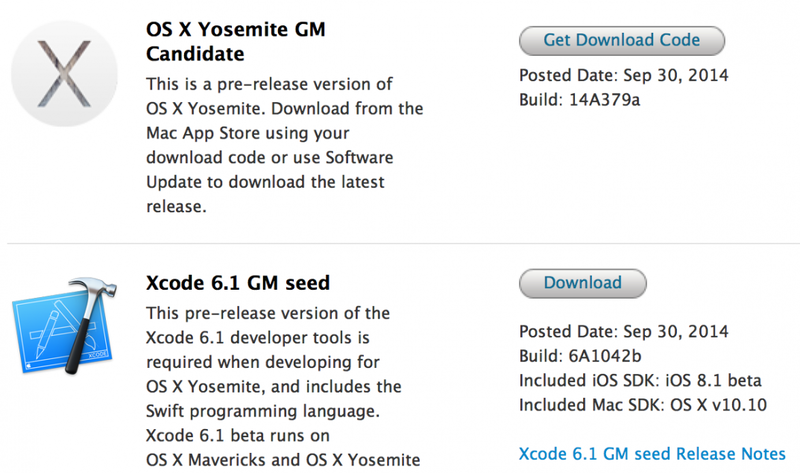 How to Download & Install OS X 10.10 Yosemite GM Candidate and Public Beta 4 Manually? Mac OS X users and developers can update / upgrade software version automatically via Mac App Store >> Software Update tab. Mac OS X developers can go-to OS X Dev Center website to officially get OS X Yosemite GM Candidate, while OS X non-developers and OS X Public Beta Seed Program subscribers can go-to Apple OS X Beta Seed Program website to manually download, install and activate OS X Yosemite GM Candidate and OS X Yosemite Public Beta 4 via iTunes without Apple UDID and without OS X Developer Account for FREE. Mac OS X general public users can also Download OS X Yosemite 10.10 Golden Master Candidate 1.0 (14A379a) Combo / Delta Update .DMG File, OS X Yosemite 10.10 Public Beta 4 (14A379b) Standalone Setup Installer .DMG File for manual installation via Bootable USB or DVD.